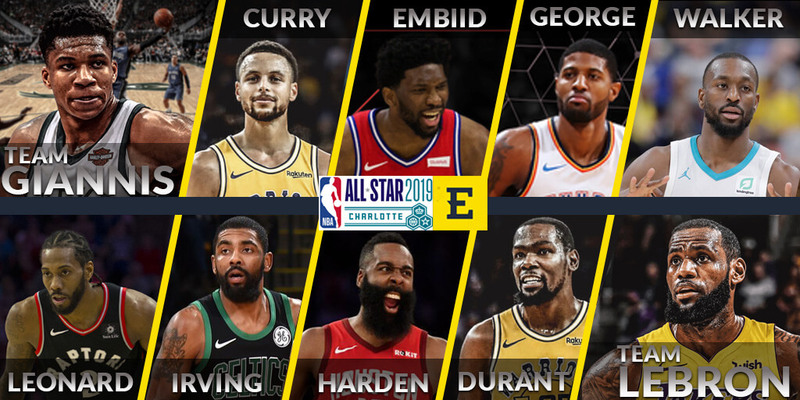 The much-awaited 2019 NBA All-Star is here, and it will kick off with an exciting showdown between Team LeBron and Team Giannis at the Spectrum Center at Charlotte, North Carolina. Los Angeles Lakers’ LeBron James and Milwaukee Bucks’ Giannis Antetokounmpo finally concluded the first ever on-screen draft last week. James picked Kevin Durant as his top choice while Antetokounmpo selected Stephen Curry. The complete roster for this year’s NBA All-Star can be found here. Team LeBron will be headed by Denver Nuggets boss Michael Malone who managed to turn a non-playoffs team into a squad making their way to the top of the Western Conference standings. The team has a star-studded starting five with Kevin Durant, Kawhi Leonard, LeBron James, Kyrie Irving, and James Harden. That’s without mentioning a bench that consists of Anthony Davis, Klay Thompson, Damian Lillard, Ben Simmons, and Dwayne Wade. It’s an understatement to say that this roster is stacked with talented players, both in terms of offense and defense so it’s safe to say that this team definitely has the edge. LeBron James will be playing his 15th All-Star game, tying with Kobe Bryant and Tim Duncan for the second most appearances in the history of the NBA league. He will be entering the contest with at least 343 All-Star points to his name, holding the record for the most field goals produced and attempted. On the other hand, Team Giannis will be led by Milwaukee Bucks’ Mike Budenholzer, the boss of the most consistent team in the league as well as the team who currently tops the Eastern Conference standings. Team Giannis has the advantage of having two top players included in the race for the Most Valuable Player (MVP) in the likes of Giannis Antetokounmpo and Paul George leading its starting five, with Joel Embiid, Stephen Curry and Kemba Walker completing the squad. Not to mention, the legendary Dirk Nowitzki is among the bench players for this team. Giannis Antetokounmpo is no doubt the best player in the East, leading the Bucks in terms of PPG, AST, and REB. Team Giannis may be a thinner roster compared to their opponents, but two top-ranked talents, along with an honorary fogey, could be enough to make this match entertaining and even more interesting. The most anticipated NBA action is here! Place your All-Star picks with our partner VOdds and have access to the best odds and prices in the market as well as exclusive offers that will make your sports betting experience more enjoyable!